Last week our school district offered an informational meeting about the health classes they are now offering from pre-K through sixth grade. 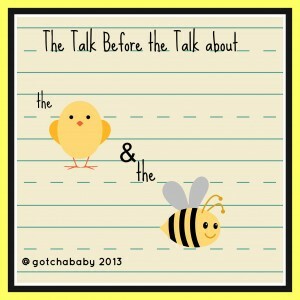 The company that’s done “the talk” classes for 5 & 6th grades is now contracted to started talking to every grade level. 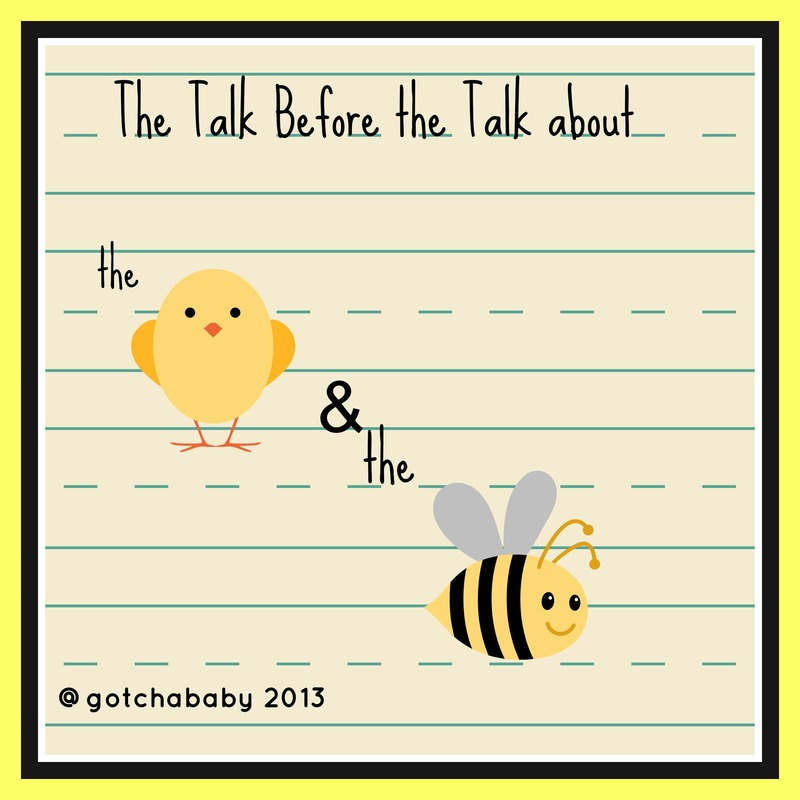 We attended the meeting so that we knew what was going to be discussed at each grade level. I don’t know where the line is for us yet- if there will ever be a lesson where we don’t agree with the information presented. For their preK-3 curriculum, they are nowhere near that line. In the preK- grade 3 curriculum, they cover bullying, being a friend, and a nutrition. They name body external body parts, and they name internal organs (non-reproductive). They talk about private parts being private, and what to do if someone makes you feel uncomfortable about your body. As the presenters were going over exactly what body parts were being named, the hands started going up. Maybe it’s because we’ve always called body parts body parts, maybe it’s because I have a child of each gender, maybe I’m just all kinds of progressive, but I honestly didn’t see what the big deal was. They are introducing four words to the children, and I have a hard time believing that my children are the only two who will already know these words. (I’m not saying this words out loud here, due to creepers who search for such things for non-educational purposes). 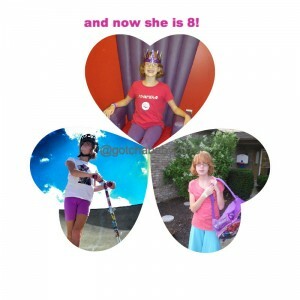 For the past week, we’ve been celebrating MaM’s 8th birthday. Being eight means you have fun at your birthday party with your friends, and you really only need me to supply the cake and the credit card. Being eight means you go off on your own with your cousins at the water park, leaving me in the kiddie pool. Being eight means at the State Fair, you ride ridiculous rides, like the Mega Drop, without blinking an eye. It means your iPod becomes an appendage, and you use it for things like an alarm clock, not just for playing Candy Crush. It means you’ve decided you want to grow your hair long so you can donate it to Locks of Love. It means you’re heading to third grade, which is much further away from the front office of the school. It means you really want, really need Skechers for school shoes. it means you sometimes crave chocolate like a grown up lady. And that you’re obsessed with Oreos (she has good taste). It means you’ll still play with toys, but don’t always admit to it. Eight. So far, it’s off to a very good start. May is the New October: She Needs a Costume? I fully expect October to be busy with all sorts of fall mayhem happening (I start with October because in my head, still, “the year” starts when the school year starts). I fully expect December to be a blur of sugar cookies, gift wrap and Christmas ornaments. I’m beginning to learn to brace myself for May. May is the end-of-everything, celebrate everything month. There’s a to-do for Girl Scouts. There’s a to-do for Sunday school. And of course, there are several to-dos that are school related. Technically Meg missed the very last day of school, but there was plenty of to-doing before that day, so we didn’t feel like we missed out. There was a second grade concert, there was a school Field Day, there was an invitation to see their most recent class project, and there was the end of school countdown via the alphabet. This is a spectacular idea- when the class was 26 days out from being done, it was A day. The next was B day and so on. Each day, there was a little something-something to look forward to. Then, on P day (ha! Mom, it’s P day, get it?) we got a note about S day. S day will be Storybook day! You child should wear a costume depicting a favorite storybook character. And there was a note about maybe not reusing a superhero or princess costume. Here’s the thing. I have never in all of my life made a costume for my kids. We bake, we make crafts, we travel, we swim, we play Mario Kart together. I don’t so much sew for them. So I did the logical thing and turned to Pinterest. How moms successfully navigated school projects before the Internets, I don’t know. Thank goodness I don’t have to find out. Thankfully, Meg knew who she wanted to be. Thankfully, there were a few pins with ideas. Thankfully she didn’t have her expectations set too high. Here are the five simple things you’ll need to make a Skippyjon Jones costume from the popular children’s books. 1) White sweatshirt with hood. We went to Goodwill and found one for $1.99. It had a pattern on one side, so she was happy to wear it inside out. 2) Brown or white leggings (we had these in her closet). 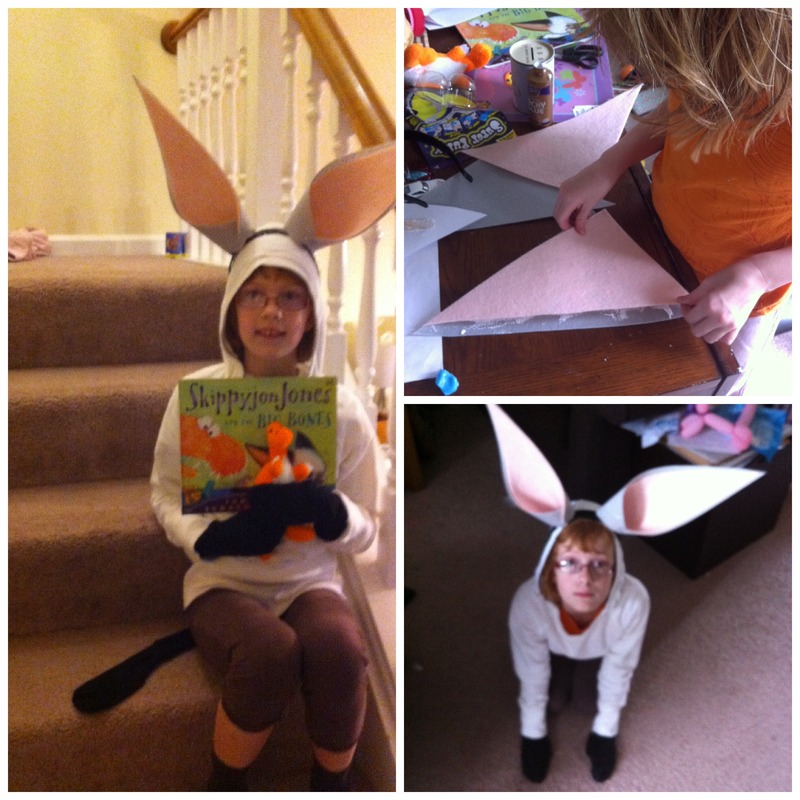 We used hot glue for the ears, and they stayed attached most of the day. We attached the tail with a safety pin. We even found an orange dinosaur like the one in the “Skippyjon Jones and the Big Bones” book, which was a total bonus. The most important thing is the Meg was involved in the making of this costume, and she was thrilled to wear it to school. That it actually resembled the character was a total bonus.